45 million tweets per second! 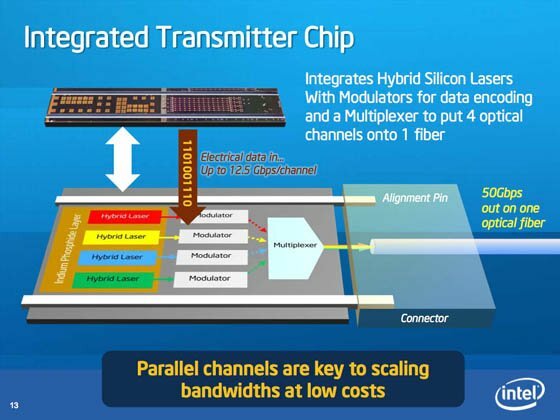 Intel has announced the development of an integrated, end-to-end, silicon-based optical system that it says may drive down the cost of high-speed, error-free interconnects to under a dollar per port — and it leaves Chipzilla's Light Peak interconnect in the dust. "Optical as a technology is coming, and its coming very fast," the director of Intel's Photonics Technology Lab, Mario Paniccia, told reporters Tuesday morning. The prototype "concept vehicle" that Intel unveiled Tuesday is essentially a two-chip system that can optically transmit and receive data at 50Gbps — a speed, Paniccia's presentation joked, that's fast enough to download 45 million tweets in under a second. 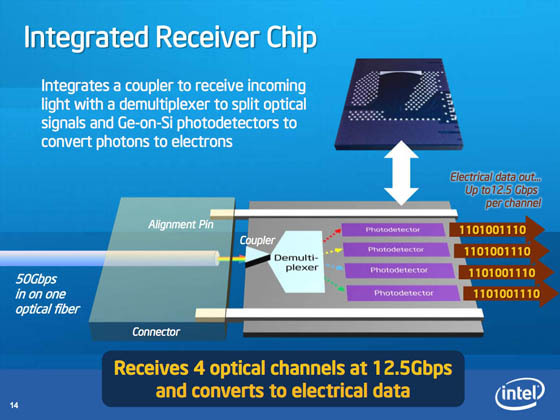 A transmitter chip uses four hybrid silicon lasers running at 12.5Gbps each and operating at different wavelengths, modulates them into data-carrying pulses, then multiplexes those pulses into a single stream of light that it beams through an optical-fiber cable. 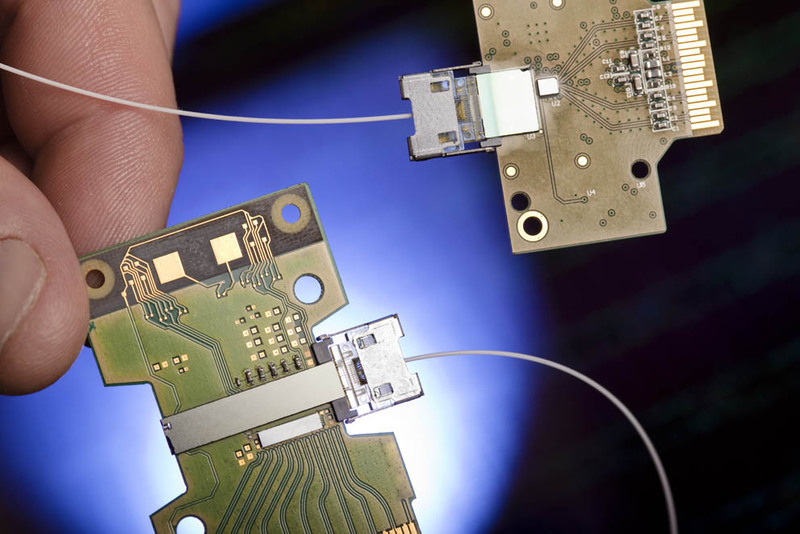 At the other end of that cable, a receiver chip demuliplexes the photon stream, distributes it to four germanium-silicon photoreceptors, which convert the pulses to electrical digital signals and sends that data on its way. "Why are we talking about photonics at all?" Intel CTO and director of Intel Labs Justin Rattner asked rhetorically. Then he answered himself: "The fundamental issue is that electronic signaling relying on copper wire is reaching its physical limits. At speeds of 10Gbps and higher, it becomes very difficult to move electrons fast enough with high enough signal strength to reach any significant distance." It's that distance limitation of copper that's one of the great benefits of optical interconnects — and not only can optical fiber carry signals much farther than copper without repeaters, but wavelength mutiplexing allows multiple signals to travel on one thin, light fiber. Intel's integrated silicon-based optical interconnect is also highly immune to errors. "We put the modules together, we had the link running ... and it ran for about 27 hours with zero errors," said Paniccia. "It's not a product, but the stability of this, the performance of this, is exceptional." Optical interconnects have, of course, been around for some time, and high-speed systems are already on the market. What distinguishes Tuesday's announcement, however, is that the entire integrated system is silicon-based — a result of Intel's ongoing work in silicon photonics. Current systems use what Paniccia described as "discrete VCSEL [vertical cavity surface-emitting laser] solutions using external lasers." The problem with those systems, he said, is that "If you look at the discrete solutions, a lot of those technologies today are still in a much higher-end market, whether it's telecom or the high-end HPC market. Here we're talking about the ability of high-level of integration, the ability of not having to [use] individual, discrete lasers, but to be able to manufacture lasers in silicon." When asked about today's 40Gbps optical interconnects, Rattner laughed. "I didn't look this morning to see what they're selling for, but my guess is that they're hundreds of dollar a port. Our goal is to get down to a dollar a port. That would be success for us." Paniccia said that Intel's goal is to spread optical interconnects throughout the computing ecosystem — from HPC to handhelds. "This is all part of our overall thrust to bring the benefits of volume silicon manufacturing technology to optical communication, and address this long-standing question as to whether optical communication can be made sufficiently affordable to be used in any kind of compute or communication platform." He was also clear that today's announcement has nothing to do with Intel's Light Peak optical interconnect, unveiled at last year Intel Developer Forum — at least today. "Light Peak as a technology will be ready this year, and will be coming to the market in 11. We've talked about that, we've announced that — that brings optical technology to the platform based on discrete components at 10Gbps. What we're talking about here is higher data-rate technologies — looking at 50, 100 gigabits, 200 gigabits." Future generations of Light Peak may adopt silicon photonics technology, but it'll have to wait until the newer tech makes it out of the lab. "Light Peak is here," Paniccia said. "Silicon photonics is still in the lab — and we're aggressively going to try to commercialize that technology in the middle of the next decade." Paniccia noted that higher speeds will be achieved by adding more lasers to the photon stream and by upping each stream's speed. Improvements, for example, may come from replacing the PIN photodetectors in the receiver chip with the high-speed avalanche photodetectors that Intel developed in conjunction with Joe Campbell of the University of Virginia and John Bowers of the University of California at Santa Barbara. How high is higher? Paniccia and Rattner envision a one terabit-per-second future, a throughput rate that would allow you to downlload the entire printed collection of the Library of Congress in about one and a half minutes. This article originally misquoted Paniccia as referring to "discrete Vixel solutions using external lasers", and not VCSEL. The quote is now correct, and The Reg regrets the error.